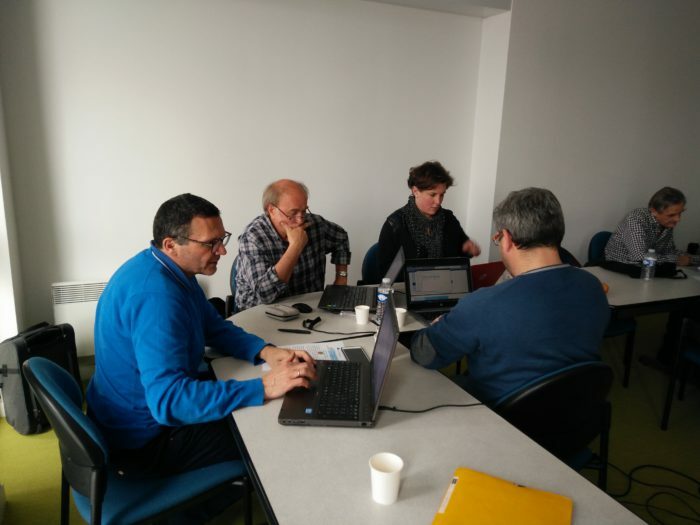 During the consortium meeting held on 27 and 28 March 2017 at the EHESP School of Public Health in Rennes, several key points were discussed by the project partners. We reviewed the parameters for the technical implementation of the Platform. Some appeared to be more complex than expected when we submitted the project. Hence we carried out a re-estimation of human and technical means required with view to reducing delays in the work package schedule. We also programmed a meeting with the Director of the EHESP School of Public Health to raise these issues during the following consortium meeting. First draft for the scenarios of the learning modules. Each working group presented their module, based on a 2-hour training model scenario. Thanks to Aline Polge expertise in ICT (Information and Communication Technology) and multimedia development (CaPp, EHESP), each group received feedback on the feasability and viability of their module. This module aims at training and developing expertise in disability. This involves both mastering the concept of disability as an evolving process and the adoption of a systemic approach, founded on the social participation of persons with disabilities. It comprises 9 sections. Following discussion the importance of learning about the Independent Living Movement’s historical background, its progression and real impact on society was highlighted. A « serious game » approach will be adopted within this module. This module aims at allowing learners to discover and think about what is involved in being a DPO leader or representative. This draws on real-life experience and case studies. It contains 5 sections. The scope and goals of the module are currently undergoing review since much new ground is being covered in the module. This module aims at raising awareness among learners, clarifying, teaching and allowing them to comprehend the UN Convention for the Rights of Persons with Disabilities (CRPD). It is based on a thematic approach. Discussions highlighted the importance of explaining how and why has the UN Convention been issued. This module may be further divided into 2 main parts, an introductory module and a more advanced module. This module aims at raising awareness of the importance of assessing access to services and infrastructure. It is based on a video and role-playing so the learners can question, collaborate, understand and analyse a health care access plan and find solutions. It is made of 20 sections so as to illustrate the 6 components of the quality of access to services and infrastructure, namely availability, spatial and physical accessibility, acceptability, affordability, usability, and accommodation. After the presentation of the modules by, each working group it has become evident that greater attention needs to be to made to fixing module priorities, goals, subjects to be tackled, together with how the different modules relate to each other. The different working groups will pay particular attention to these issues. This group is currently writing a « Guide on Accessibility », incorporating to the greatest extent an Easy-to- Read approach, with entries based on activities and not on impairment types. The section on Moodle Accessibility is pending. A checklist with the main accessibility principles will be circulated during the next meeting in May (M4). 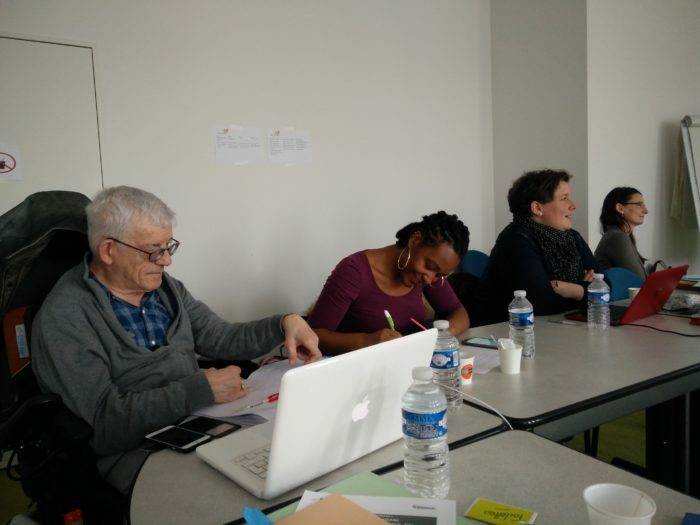 The group has also requested feedback on the Guide from the different partners, before its editing and reviewing by members of the Collectif Handicap 35. The group presented the design choices made for the launch of the project’s promotion website. The process for organizing the translations of project news in Romanian, English and French Easy-To-Read was also outlined. Several issues were raised in relation to the project, accessibility and communication flow.